A Tauchboot is a submarine, and a Tauchbootbrief is, unsurprisingly, a letter transported by one. Specifically, the term is normally reserved for letters transported by cargo submarine from Bremen to USA during WWI. Or at least, intended to be thus transported: events overtook the plans, as can happen in Europe. Until relatively recently, little had been published about this mail-carrying system. Now, there are a couple of books, several displays, and numerous web pages concerning it. Most are in German. Examples of Tauchbootbriefe have emerged, and are sometimes offered for sale at large prices. A recent article in the London Philatelist (September 2016 pp 359-374), repeated in Stamps of Hungary (Dec 2016 pp 6-21) by Ute and Elmar Dörre, is entitled "Hungarian WWI submarine letters to the Americas". This article will concentrate on the Austrian aspects of Tauchbootbriefe, which were a small part of the whole. When WWI began, the British created a naval blockade in the North Sea; this prevented Germany importing raw materials such as rubber, zinc, nickel, and cotton. Herr Alfred Lohmann, President of the Bremen Chamber of Commerce, suggested an unarmed cargo- and mail-carrying submarine service, enabling trade to continue between Germany and neutral countries such as the USA. A special company, the Deutsche Ozean Reederei, was founded in November 1915, and two submarines built: the Deutschland and the Bremen. Each had a crew of 29 and could carry 600 tonnes. The Deutschland was ready first, and made two return trips to the USA in June-August and October-December 1916 (each leg took about 3 weeks). The Bremen set off on 26 August 1916 - and hasn't been seen since. The British Navy have no record of sinking it; it may have hit a mine. Nevertheless, a third trip by the Deutschland was planned for 15 January 1917, with a cargo including 10 tonnes of private mail. Approval was obtained from the governments of Austria, Hungary etc, and an announcement made to the public on Christmas Day 1916. Mail had to be franked at UPU rates (eg 20pf for a 20-gram letter), then placed unsealed in an outer envelope addressed to "Tauchbootbrief nach Bremen" and franked with the 'submarine surcharge' of 2RM per item. The invitation from Berlin to Vienna, and presumably to other Axis countries, to take part was on 25 December. The fact that the official Austrian position was not confirmed until rather later means that their permission was not in place on 25 December. This looks like a slightly belated invite from the Germans - one suspects the Germans themselves made the announcement public on or about 24 December, and this was picked up by the Austrian newspapers before the government got its invite and approved acceptance of the invitation and willingness to go along with the idea. The Austrian newspaper articles of 1917 give the charges in Austrian currency [postcards & letters 3Kr up to 20 gram, 6Kr for 20+ to 40 gram, 9Kr for 40+ to 60 gram], and refer to a decree of the Trade Ministry. This has proved elusive! There is nothing in the "Post- und Telegraphen-Verordnungsblatt für das Verwaltungsgebiet des k.k. Handelsministeriums" of 1916 and 1917 – this is the official collection of postal decrees from Vienna. Nor is there mention in the "next layer down", the Lower Austria Verordnungsblatt. However Dr Moser has found it at Innsbruck, set forth in the "Amtsblatt der k.k. Post- u. Telegrafen-Direktion für Tirol u. Vorarlberg 1917 17/3 Seite 13-15; Nr. 48.741/IIIa". This begins: "Beförderung von Briefen und Postkarten nach überseeischen Ländern mit deutschen Handels-Tauchbooten [Tauchbootbriefe]. Das k. k. HM hat mit dem Erlass vom 29. Dez. 1916, Zl. 39.045/P Folgerndes anher eröffnet ‘Zur Beförderung mit deutschen Handels-Tauchbooten können bis auf weiteres ...’…". The complete text is transcribed later. So, at last we have the Austrian Decree: k.k. HM Erlass vom 29. Dez. 1916, Zl. 39.045/P. Or at least the filing reference for it. 'Zl' means either Zahle or Zeile or (akten)Zeichen depending on who you ask. I have tried to find this in the on-line index for the State Archives but failed. I did find that "The fire at the Palace of Justice in July 1927 considerably reduced the holdings of the Allgemeines Verwaltungsarchivs" - not vey promising. Folder 39045-16P, opened on 29 Dec 1916, deals with the Handelsministerium’s response to a telegram from Berlin on Xmas day followed up by several appendices. The filed copies appear to be "working documents"; the front cover records what it’s about and to whom it has been communicated. 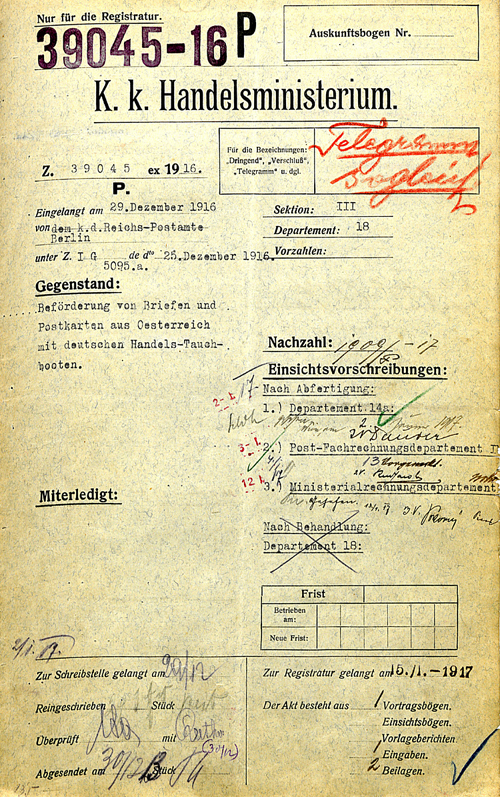 Appendix 1 is a memo from the Reichspostamt in Berlin to the Handelsministerium’s Section III in Vienna outlining the proposals. The costs were to be shared amongst the participating countries, who should recover them from correspondents in whatever way they saw fit. It says what ‘submarine surcharge’ Berlin will levy, but leaves it to Vienna to set theirs. And it asks that correspondence should be by telegramme as the next sailing will be soon. Appendix 2 is untitled, undated, and unsigned – and heavily altered in red ink; it looks like translations from Prussian into Austrian! The amended wording is also the text of the Innsbruck Amtsblatt; and give or take a few editorial tweaks is also that published in the Austrian newspapers. The folder was handed over to the registry (for indexing and archiving) on 15 Jan 17. One suspects a mad scramble when Berlin realised that they hadn't actually remembered to inform their allies, and sent a flurry of telegrams - the sailing date being by then decided although not made public. It seems likely that post offices in Austria were told about this not by formal paper communication, but by telegram, in a bit of a panic. Interestingly, Hungary was much quicker off the mark in telling the populace! The front cover of Folder 39045-16P; providing a summary of what it covers and notes on who has formally seen it. 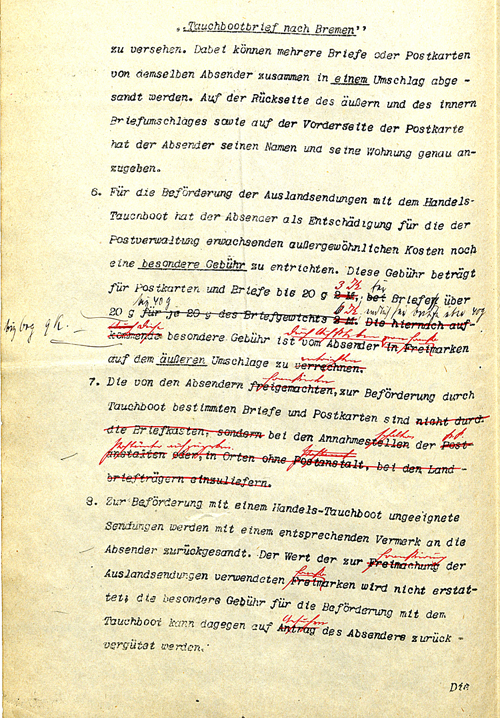 A page from Appendix 2, showing the extent of the corrections made in Vienna to Berlin’s document! Folder 1450-17P, opened on 13 Jan 1917, records the Kriegsministerium getting involved by slightly rewording a few sentences, and ‘requesting’ that the facility be extended to Bosnia-Hercegowina. It was handed over to the registry on 3 Feb 1917. Folder 1909-17P, apparently opened on 7 Feb 1917 but containing material dated 13 Jan 1917 and stamped 17 Jan 1917, is a memo from Berlin on the accounting arrangements for mail from Bosnia-Hercegowina; attached is the form for recording the total number of items at each rate. Registration was on 17 Feb 1917. Over 60,000 items were submitted for the third Tauchboot trip. The German High Command decided in January 1917 to introduce a policy of Unrestricted Submarine Warfare, expecting to starve Britain into submission before America could enter the war and mobilise. The USA broke off diplomatic relations with the German Empire on 3 February 1917, and declared war Germany on 6 April 1917 (and on Austria on December 7, 1917). Transatlantic cargo submarines no longer seemed a good idea. The items sent to Bremen were cacheted "Zurück. Wegen Einstellung des Tauchbootbriefverkehrs zurück an den Absenderquot; and were then returned to the sender, who could take the outer envelope to their Post Office and have the surcharge refunded. 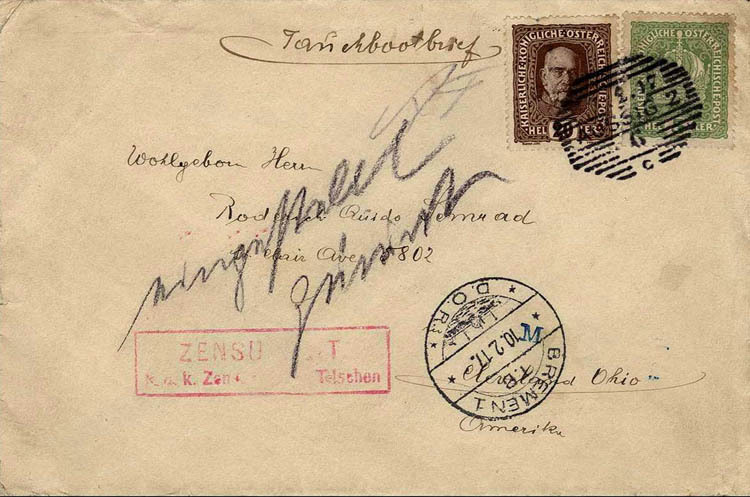 These outer envelopes were supposed to be retained as a receipt and then destroyed, in case the high-value stamps were cleaned and reused, but as usual some found their way to the philatelic trade. 1. Die Briefe und Postkarten unterliegen hinsichtlich der zugelassenen Sprachen und der sonstigen Anforderungen den während des Krieges aus militärischen Rücksichten für gleichartige Sendungen nach dem neutralen Ausland angeordneten Beschränkungen. Letters & cards must comply with the wartime regulations for sendings to neutral countries. 2. Das Höchstgewicht der Briefe darf 60g nicht übersteigen. Max letter weight 60 grams. 3. Die Sendungen (Briefe und Postkarten) müssen frankiert und auf der Vorderseite mit "Tauchbootbrief" bezeichnet sein. Letters & cards must be franked, and be marked "Tauchbootbrief" on the front. 4. Für die Briefe und Postkarten gelten die Gebührensätze des Weltpostvereins. UPU rates apply to letters & cards. 5. Der Absender hat die Tauchbootsendungen in einen offenen Briefumschlag zu legen und diesen mit der Aufschrift "Tauchbootbrief nach Bremen" zu versehen. Dabei können mehrere Briefe oder Postkarten von demselben Absender zusammen in einem Umschlag abgesandt werden. Auf der Rückseite des äußeren und inneren Umschlages sowie auf der Vorderseite der Postkarte hat der Absender seinen Namen und seine Wohnung genau anzugeben. The sender shall put his mail in an unsealed envelope addressed to "Tauchbootbrief nach Bremen". More than one item may be put in a single envelope. The sender shall put his name and address on the back of the outer and inner envelopes and on the front of a postcard. 6. Für die Beförderung der Auslandssendungen mit dem Handelstauchboot hat der Absender als Entschädigung für die der Postverwaltung erwachsenden außergewöhnlichen Kosten noch eine besondere Gebühr zu entrichten. Diese Gebühr beträgt für Postkarten und Briefe bis 20g 3K, für Briefe über 20g bis 40g 6K, endlich für Briefe über 40g bis 60g 9 K. Diese besondere Gebühr ist vom Absender durch Aufkleben von Frankomarken auf dem äußeren Umschlag zu entrichten. The sender must pay a special rate to cover the postal service’s extra-ordinary costs of forwarding by cargo submarine by affixing adhesives to the outer envelope (postcards & letters up to 20 gram 3Kr; 20+ to 40 gram 6Kr; 40+ to 60 gram 9Kr). 7. Die von den Absendern frankierten, zur Beförderung durch Tauchboote bestimmten Briefe und Postkarten sind bei den Annahmeschaltern der k. k. PÄ abzugeben. The franked items for forwarding by cargo submarine are to be handed in at the P O counter. Wann Briefsendungen mit den Handelstauchbooten befördert werden, wird nicht bekannt gegeben. Die Absender müssen daher unter Umständen mit einer längeren Beförderungsdauer rechnen. The sailing date of the submarine will not be made public; senders must expect a long delay. Die "Tauchbootbriefe" sind hinsichtlich Leitung und Zensurierung wie andere Auslandsbriefe zu behandeln. 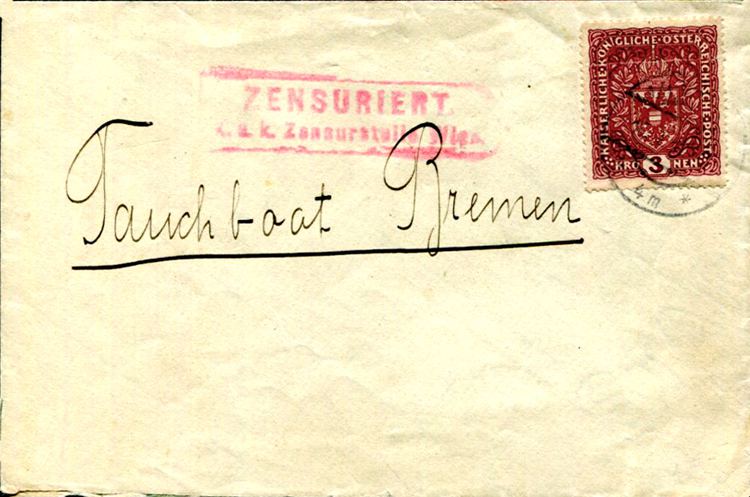 Tauchbootbriefe will be handled and censored in the same way as all other foreign mail. ANNO - Austrian Newspapers Online – is an extremely valuable and ever-growing resource, containing scans of many newspapers. Many have been OCRd (with an accuracy dependent on the quality and font of the original); click the TXT icon at top right of their screen. This list contains links to the matches returned by the ANNO search engine when told to look for "tauchbootbrief". Neue Freie Presse 6. Januar 1917: "Tauchbootbrief nach Amerika / An eine Wienerin in Newyork". Extensive and fanciful essay on the social benefits of Tauchbootbriefs. Linzer Volksblatt 12. Januar 1917: Exactly the same. Mährisch-Schlesische Presse 13. Januar 1917: Introduction then detail-para. Prices in Kronen. Separately, injunction to post early. Cetinjer Zeitung 18. Januar 1917: Brief outline of the service; no details. Prices in Marks. The author thanks Roger Morrell, Otto Teufel, Mag Eva Sinnmayer, Dr. Susanne Kühberger, Dr Hans Moser and others who have helped him.